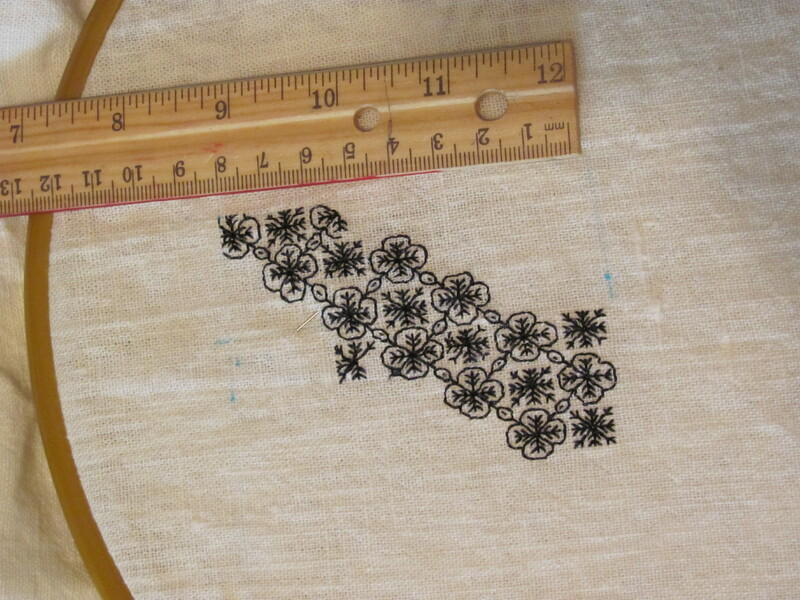 It’s been a while since I’ve posted about my blackwork needle-case. I took a small break while I was doing the research on the cotte project. After picking it back up a few days ago, I’m almost half done with the cover. Doesn’t sound like much, but let me give you some perspective. Each repeat is about 1 cm squared. Yep, one cm. Each one takes me 30 to 45 minutes to complete. If I over or under stitch by even one thread, I have to rip out back to the point where I digressed. I admit that I am pretty slow, but my work has less and less mistakes as I go along, which means less and less ripping out. I’m hoping that as I practice, I’ll be able to go faster – or at least I’m still holding out hope. 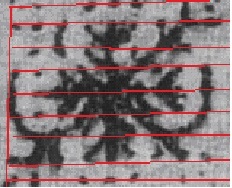 The red solid lines are the outline, and the dashed one is the middle. It’s coming along, and it helps make watching “Supernatural” less scary. On to the side-laced cotehardie. I’m picking out the color for my fabric, and I’m leaning towards a bluish-green. I test dyed two different colors of linen. 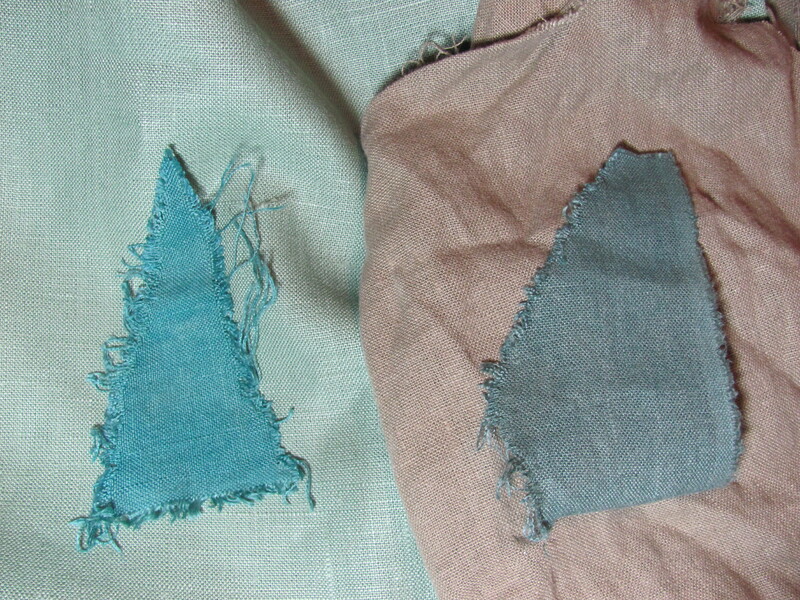 Both of these linens I have used to make several items, and I’m pretty tired of the colors. It was on sale for a really good price, so I bought way too much. I’ve been into tie-dying for the last couple of years. It started out as a fun thing to do at a non-traditional baby shower, and it stuck. I’ve moved on from using Rit dye. Please, please, please, please never use Rit dye to dye nice linen. Don’t even use it to dye not so nice linen. 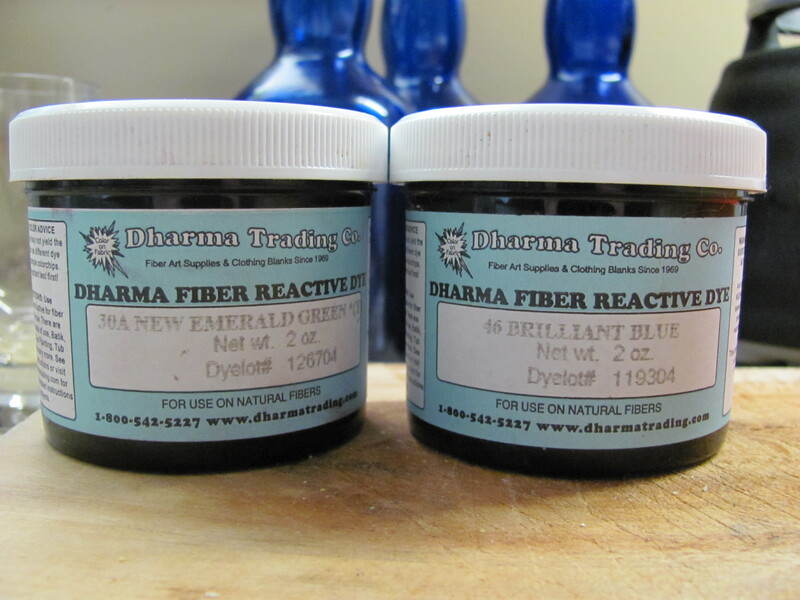 Dharma Trading Company sells the best fiber reactive dyes that don’t fade and don’t bleed. This is what I use http://www.dharmatrading.com/html/eng/3796-AA.shtml?lnav=dyes.html. 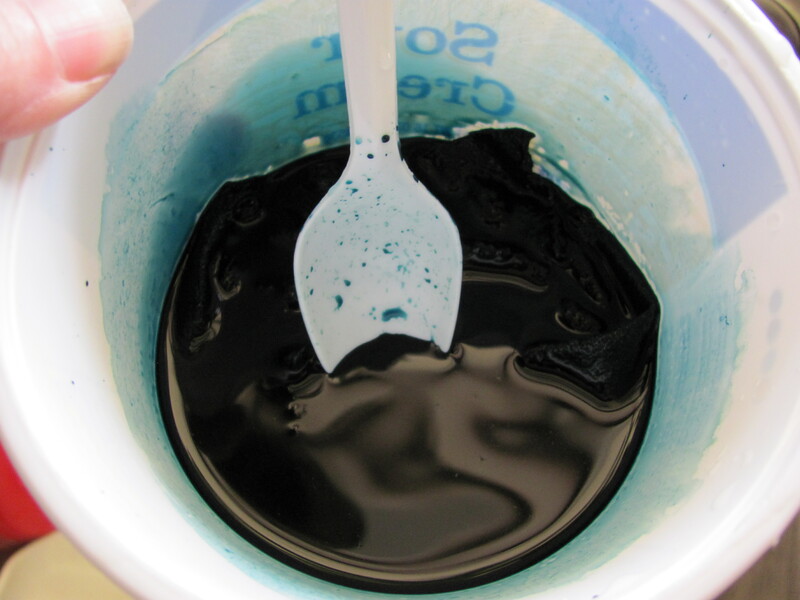 I have a bunch of odds and ends left from tie-dying, and I’m trying to find a good mix to make a nice color. Of course I do promise my good friend E that I’ll replace anything I use up. Today’s mix was brilliant blue and emerald green, about half and half. I mixed a very small amount and let it soak for a couple of hours. Recycled containers are great for this kind of work. The fabrics under each swatch are the base colors. The swatches are what the fabric looked like after dying. With this mix, I like the green one better. A bit darker would be nice, but the tone is good. Tomorrow I’ll try a bit more blue. Oh my, I haven’t posted in a few days. It’s nearly Halloween – my favorite time of year. I’ve been, among other things, having fun with the kids. We were invited to one of their teen friend’s Halloween themed birthday party, and so I decided it would be the perfect occasion to go as something really scary. Unfortunately, I didn’t count on a side-trip to Walmart for the friend I was riding with to pick something up. 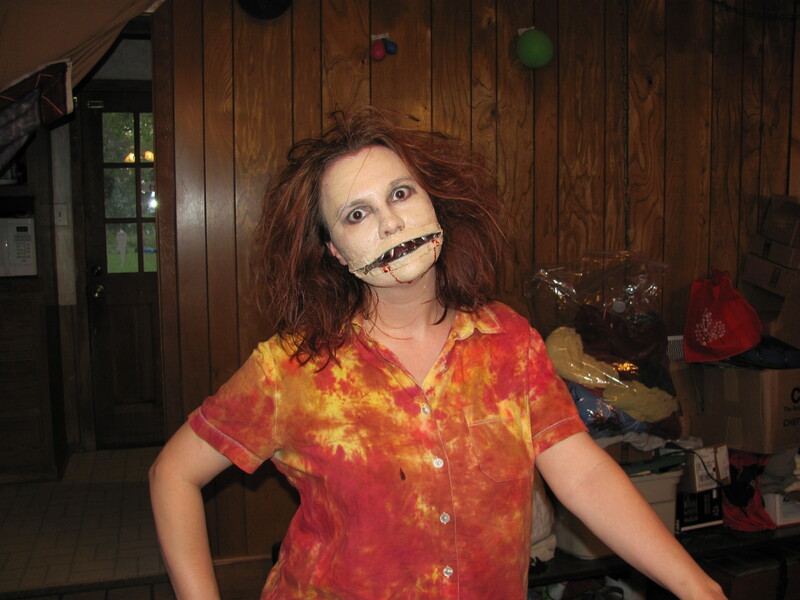 Let’s just sum it up and say that children screamed, I felt bad, and you may see me on the People of Walmart page. Now on to the other fun stuff. I’ve been continuing work on my needle case. It’s slow going, but my repeats are more consistent and I am picking up a bit of speed. 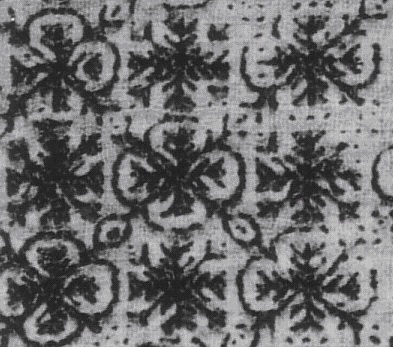 I’ve also been analyzing other blackwork fill-in patterns from 16th century pieces. 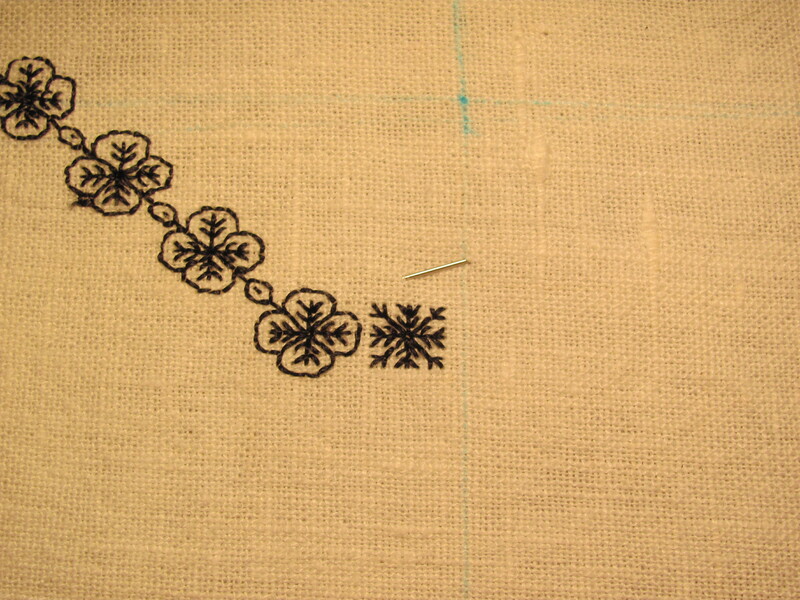 I have two more from the same piece as pattern #1 (see needle-case above). 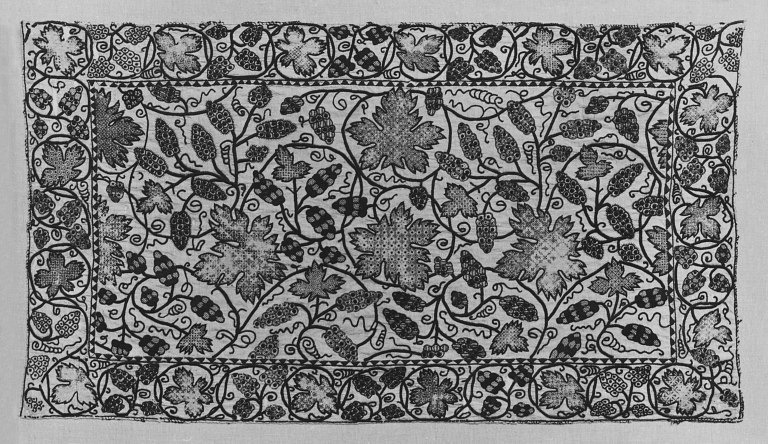 It’s an English 16th century pillow-cover from the Falkland Collection at Victoria & Albert Museum http://collections.vam.ac.uk/item/O317803/pillow-cover. 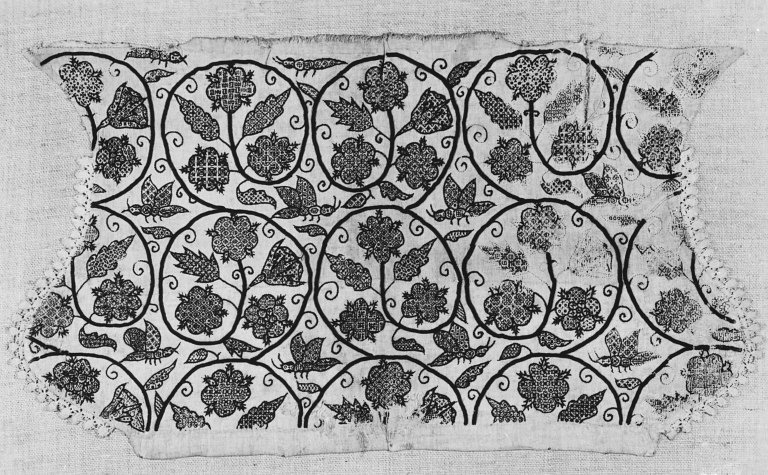 16th century pillow-cover from the Falkland Collection at Victoria & Albert Museum. can be done in either direction. It’s a really easy pattern, but the simplicity doesn’t mean that it isn’t very nice when used. It reminds me of seeds on a strawberry. 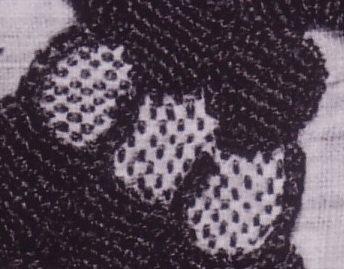 The pattern itself is simple to recreate – alternating dashes. 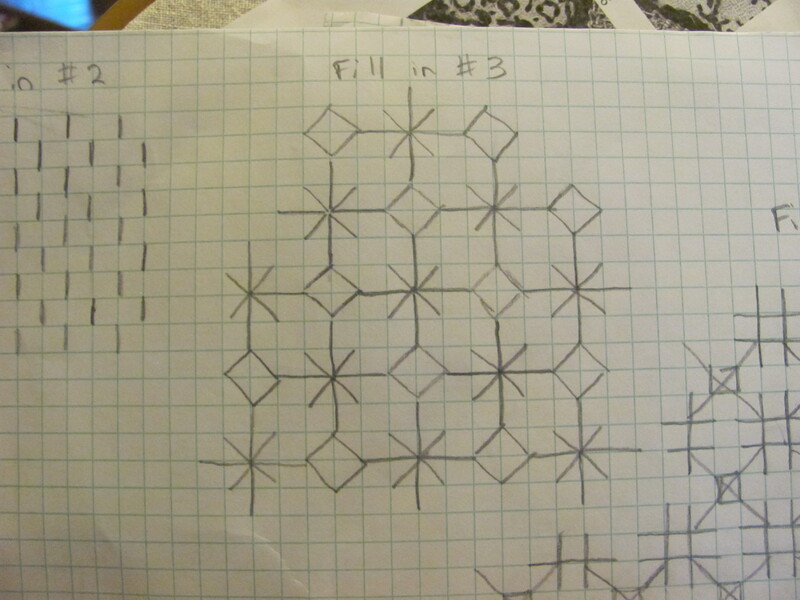 My third fill-in pattern is the last one from the same pillow-cover. It’s more complex than the one above, but it’s still fairly simple – diamonds and stars. My analysis may have an error, but I like it my way. If you look near the upper right corner, you can see that the diamond has a vertical line going through it connecting the center to the stars above and below, but I like it better with the space open. I’m hoping to finish up my the embroidery on my needlecase this week. I clamor about the time it is taking, but I need to realize that it’s not the project I’m working on but learning the art. Learning a new art does take time. Started working on my needle case. 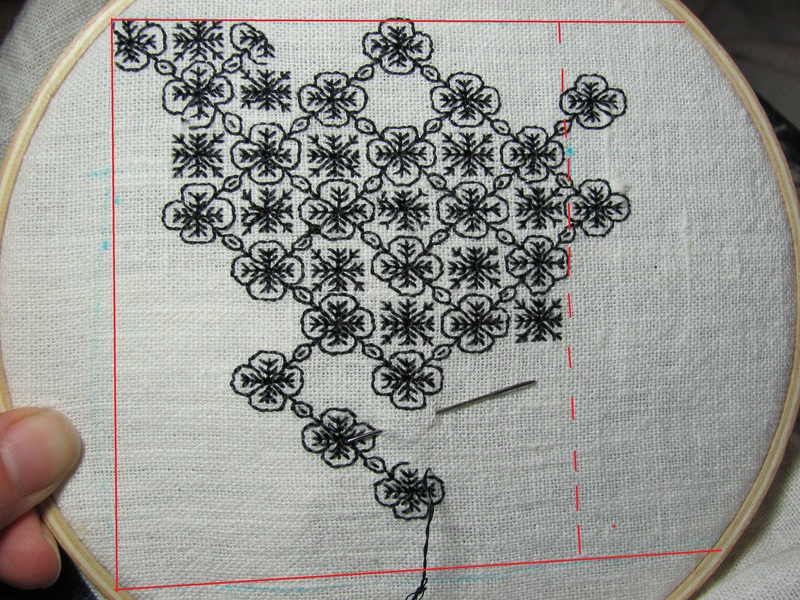 To give myself more practice with working this blackwork fill-in pattern, my needle case cover will be made up entirely of the pattern. To add an extra degree of difficulty (as if that was necessary), I’m using linen that isn’t an even count weave. 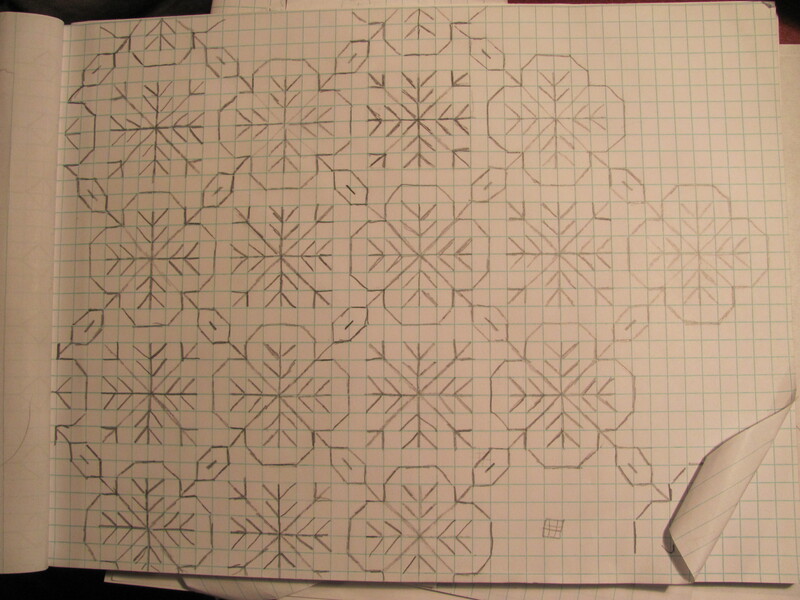 The first six repeats of the pattern are all flawed. Some more than others. Mostly because I miscounted a thread or didn’t see a thread. But the 6th one, that is perfect – or at least as perfect as an uneven weave will allow. My perfect repeat is on the bottom right. It’s so pretty!!! 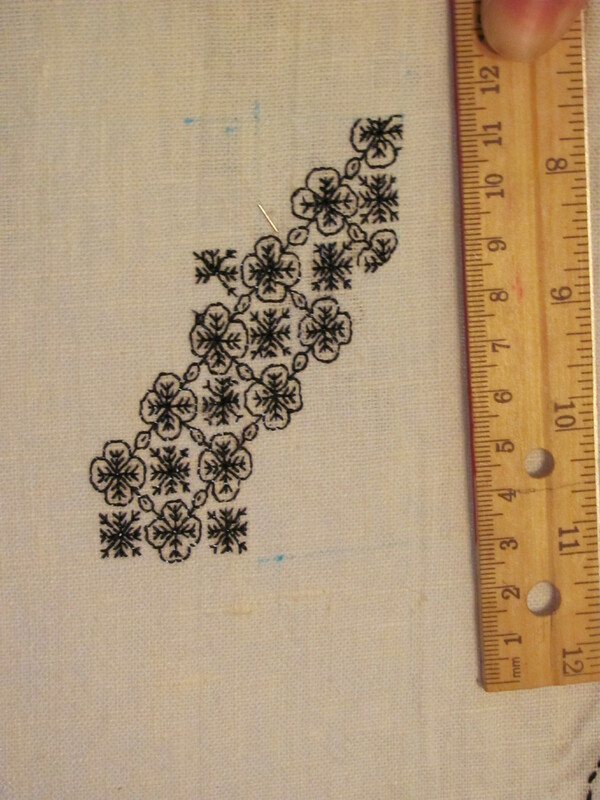 Being so happy about finally stitching the perfect repeat, I tried another repeat from this same fill-in patter. It came out flawless too. I am possibly catching on!! There was a point in time when I thought, “Blackwork looks easy enough. 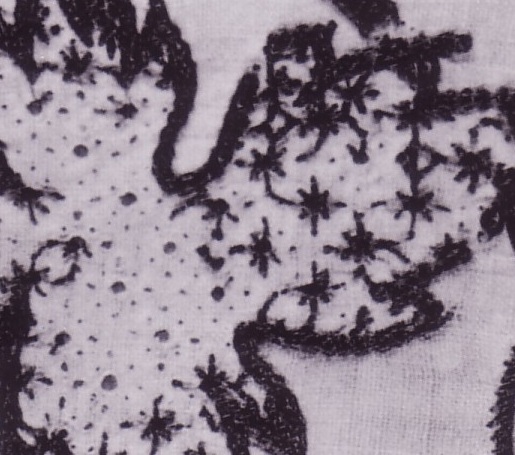 It’s just black thread on white fabric” and “Counted stitch embroidery is a joke! I mean, how difficult is it to count threads.” As it turns out, it’s pretty damn difficult. I have a whole new appreciation for you cross-stitchers! And I have certainly said a few choice words to the past me that had such thoughts. I’m still working on learning the Holbein stitch. Whatever little rule of thumb that one needs to know in order to do the Holbein stitch automatically, I have yet to learn. 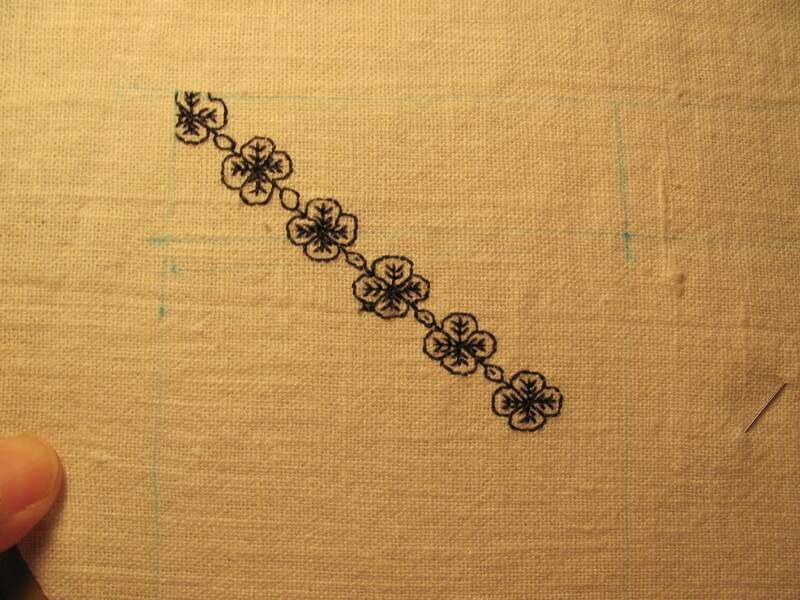 Instead, I’m just patterning the heck out of anything I want to Holbein stitch. 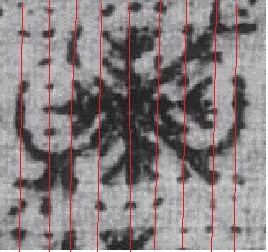 I found an English pattern from someone’s cuff – appropriately from a Holbein painting. 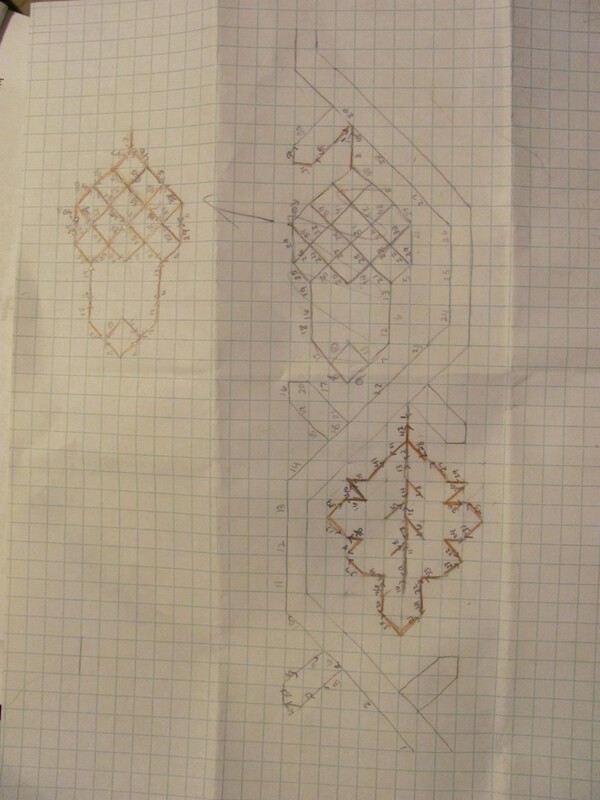 I took the acorn and leaf motif, sketched it on some graph paper and spent a couple of hours figuring out the exact order of the stitches from start to finish. I can’t decide if I like it better done with one or two threads. It’s nearly exactly like one of those matchstick games from grade school. The teacher gives you 5 matchsticks and tells you to make some nearly impossible shape with them. You sit there for an hour arranging them this way and that way, until *bang* the solution seems too simple and obvious to be right. But there it is. Once I figured out the stitch order, it seemed so “duh, of course,” but that was only after I spent a considerable amount of time erasing failed attempts. My finished charted pattern. To be certain that each stitch was done on both the front and the back sides, I used a normal pencil to designate the front and an orange one to designate the back. Yes, it would be easier just to use the back stitch, but then the back would have twice as much thread on it than the front and look bulky. Once each stitch has been marked with both normal and orange pencil markings, then I knew the charting was done. Eventually I had to start over on the acorn (thus the crossed out version attached to the vine). 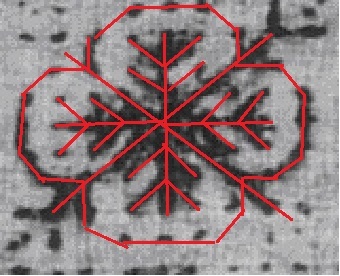 The cross work on the acorn was a major PITA. But it’s done. 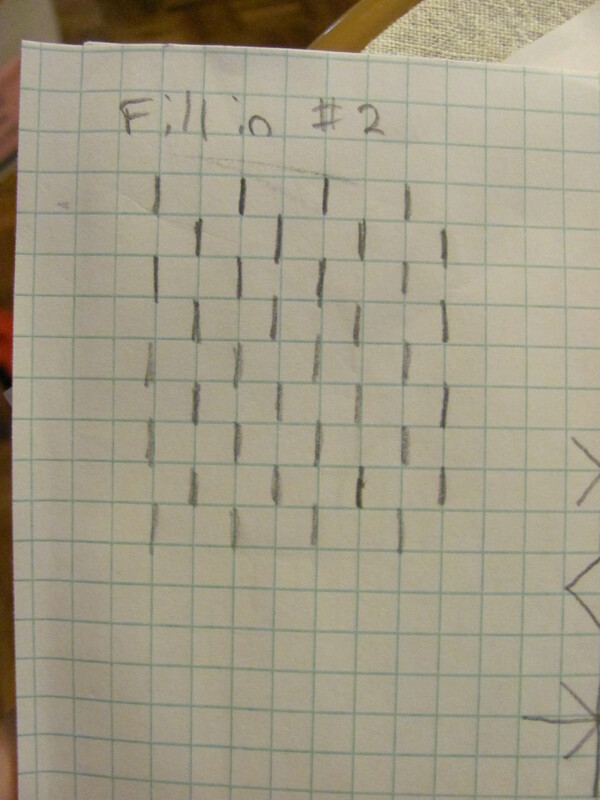 I don’t know if I’m going to use it, but I learned a good deal about plotting stitches.